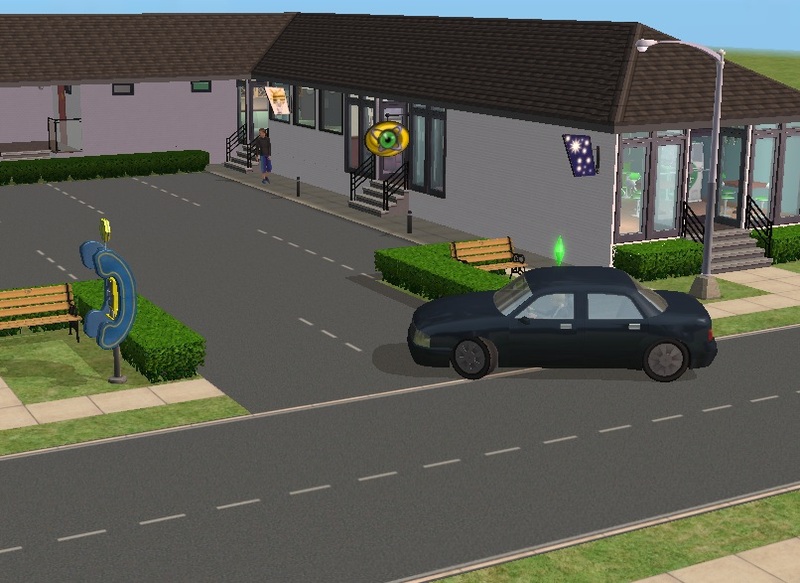 In the very first Sims 2 game I was curious why the various community lots in Pleasantview had large car parking areas where there were no cars. Then the Nightlife Expansion Pack came out and Sims had cars to drive, but parked on the side of the road when visiting community lots. Why don't they park in the car park? Having made a mod to fill your empty car parks with cars, this mod now allows you to park among them. This mod updates the driveway objects to allow the placing of them on community lots where they can then be used to park on by Sims driving to that lot. Please make sure you have the latest version of the decorative parking spaces to use in combination with this mod. If you don't, you will find that your cars get put into the decorative parking spaces and your Sim cannot get out. I have also built an example lot to show you what I was imagining when I made this. This object works with all EPs from NightLife onwards, including if you do not have NightLife, but do have Numenors Driveable Cars without NL. If you have no EPs beyond Nightlife (i.e. you have NL only or UNI and NL) please download the package entitled "NIGHTLIFE-ONLY-driveway-as-a-parking-space-Mog-20101104". If you have Double Deluxe or any EP beyond NightLife please download the package entitled "BEYOND-NIGHTLIFE-driveway-as-a-parking-space-Mog-20101104". If you have CrammyBoy's Community Time Project please additionally download the package entitled "CTP-COMPATIBILITY-driveway-as-a-parking-space-Mog-20101104". I have named the file inside the .rar so that it will be loaded after this mod and the CTP mod if you place all three in the same folder or sub-folder. If you have an array of different sub-folders, please read more about Load Orderwiki to understand where to place it. Please note: You must have the NightLife EP OR any EP/SP later than NL as per the description of Numenors Driveable Cars without NL. In short, if you have cars, you can use this mod. Here is some advice on building a car park with this mod in combination with my decorative parking spaces. Please make sure you have the latest version of the decorative parking spaces to use in combination with this mod. If you don't, you will find that your cars get put into the decorative parking spaces and your Sim cannot get out. Start by placing your driveway and extensions so you know where the usable parking space is going to be (the driveway will be followed all the way to the end when used as a community lot parking space). Lay down the flooring your car park is going to have - for example tarmac. Mark out any lines you want to indicate parking spaces. 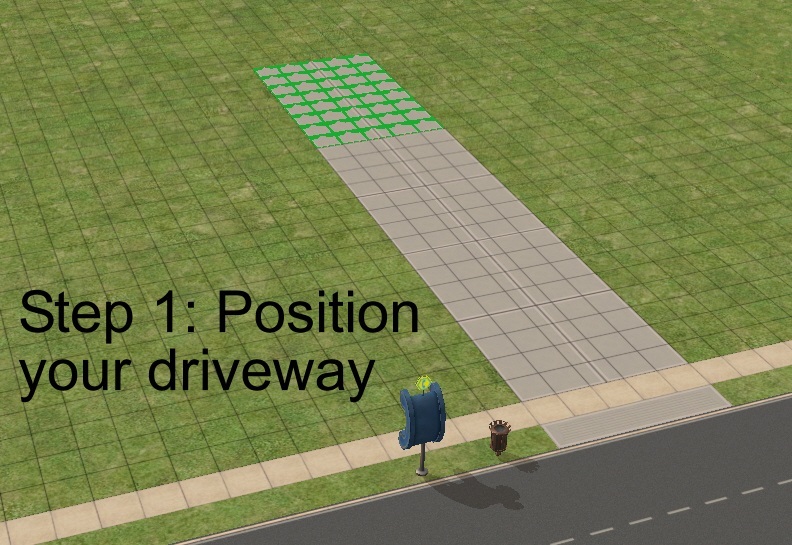 Although the driveway is 5 squares wide, only the middle three squares in width are used for parking - the excess is to allow the Sims to get in and out of the car. Recolour your driveway and extensions to be transparent. Suggest using this recolour. 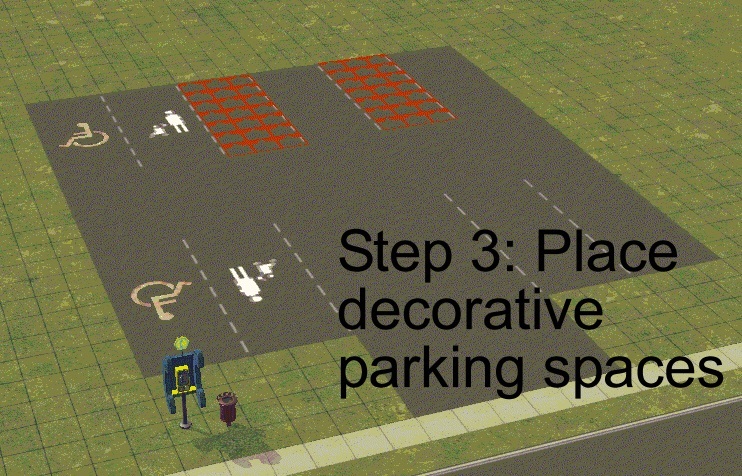 Place decorative parking spaces in all the marked out parking spaces except for those on either side of the usable parking space. 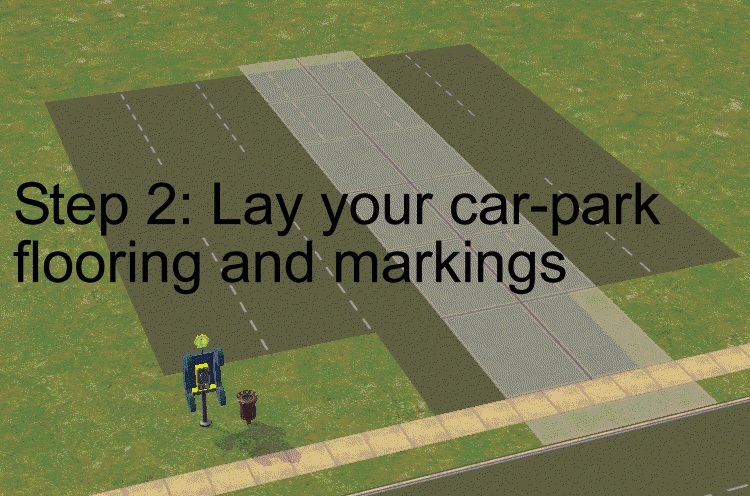 Placing a decorative parking space overlapping the edge squares of a driveway will stop the Sims from being able to get out. If your Sims NEVER have passengers when they drive to Community lots then you can afford to place a decorative parking space on the passenger side of the driveway, but never place one on the drivers side of the driveway. This previously clashed with CrammyBoy's Community Time Project, but an extra package to fix this clash has now been provided. I don't know of any other mods this clashes with. There is always the possibility of course, so the pertinent information for the owner of the other object is here. Chloe.Cirocco, epiphany10021 and Gwenke33 for testing the CTP compatibility package. 2557 people have said thanks to MogHughson for this download.